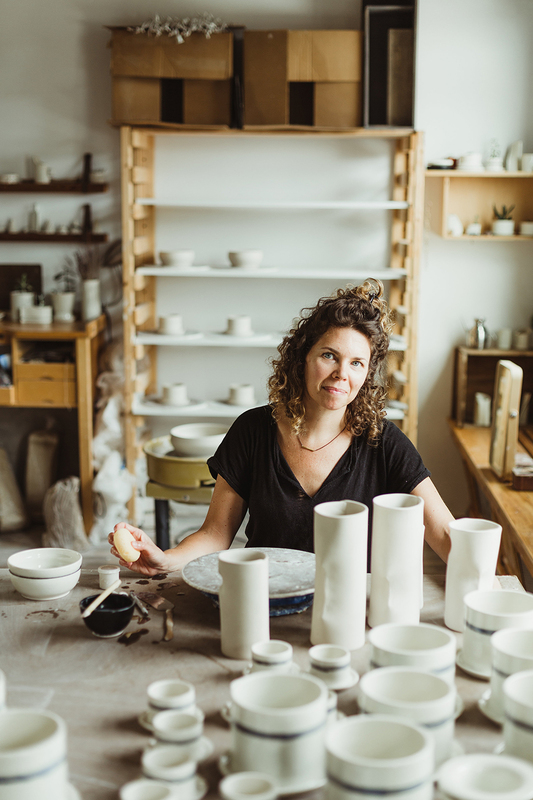 Founded in 2009 by Cara Taylor, Taylor Ceramics is a line of handmade vessels and planters for the home and table. An interest in lines that are sewn, woven, and drawn onto or into the surface of simple, classic forms are the elements that unify all collections. Having always been fascinated with containers and the objects that occupy the space inside, I make forms to hold the objects I love the most - flowers and herbs from the garden, dried pods collected on a long walk, a slow growing jade or the coffee that begins my daily ritual. Besides throwing on the wheel I love to work with thin slabs of clay and experiment with the ways in which I can fold, bend and wrap the flat sheets into 3d forms. I strive to create subtle curves, interesting overlaps and unique juxtaposition of materials by incorporating waxed linen stitching. The surfaces of my wares are simple ranging from matte white to a clear gloss to unglazed and textural. These classic finishes allow for the emphasis to be on other elements such as shape, texture and very subtle hints of color that get integrated into the pieces during the building stage. Taylor Ceramics is also available on Etsy: www.taylorceramics.etsy.com If there is something you found here that you don't see anymore, please visit that site to make a purchase.